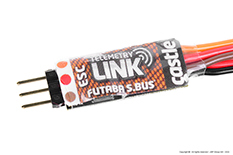 S.BUS2™ extends Futaba S.BUS™ and supports bidirectional communication. Compatible radios will support S.BUS2 protocol. It is also necessary to utilize a compatible Futaba® Telemetry Receiver. Click here to view the Futaba® Radio Compatibility Chart.